Pilates and Pillows - Colette Freedman is a top Hollywood Script Doctor who has also ghost written several novels. Pilates is the greatest workout on the planet for the mind, the body and the soul because, simply said — YOU GET TO DO IT LYING DOWN. I never ventured into the world of pilates because I always felt somewhat intimidated. I assumed it was limited to wealthy suburban moms who were completely overwhelmed from shopping, who needed well deserved down time after their nannies dropped their progeny off at private school. Boy, was I wrong. Pilates is an all inclusive sport to which I am completely devoted. And let me just mention again: I get to lie down. Before becoming a devotee, I was completely misinformed about pilates. I assumed it was a rich person’s sport. A thin person’s sport. An elitist’s sport. I was pleasantly mistaken. People like me show up! And there are so many benefits to Pilates which builds flexibility, muscle strength and endurance… and… not to repeat myself: you get to lie down. After buying a pilates package on groupon (for the record, I am quite adept at buying exercise packages; however, not so adept at actually using them. But I am a whiz on groupon), I was thrilled to discover that not only do you get to lie down for most of the hour, you also get to have a pillow. A pillow! This isn’t your mother’s gym! The pillow is optional, but I always option yes! The pillow is a sobakawa buckwheat pillow which conforms to the neck. Pilates demands intense focus: You have to concentrate on what you’re doing all the time…and it’s definitely easier to do when your head is cradled in a comfortable, supportive and therapeutic sobakawa. Sometimes, you even forget that you are doing an incredibly difficult maneuver because you are so comfortable! It’s like you want to fall asleep and stay awake at the same time. Although pilates takes work, mental acuity and intense focus, it also comes with a soft pillow — if I could only bring a blanket, they would simply call it — sleep. Colette, when did you ever snap that picture in MY class?! 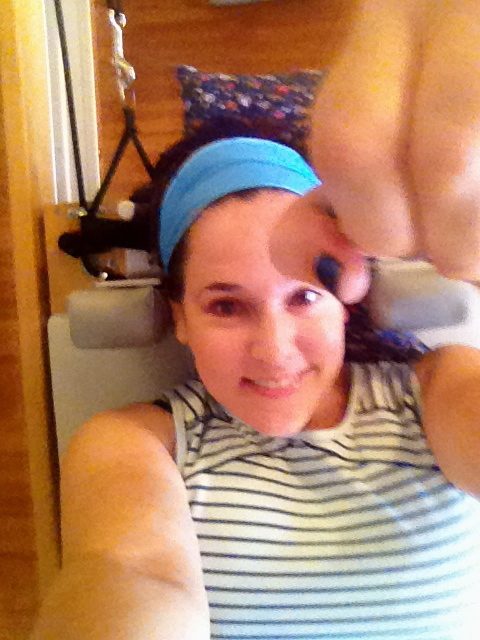 Love the post – guess you’re not joining me at Bar Method anymore. Might have to follow you to Pilates! Love the new blog look too.